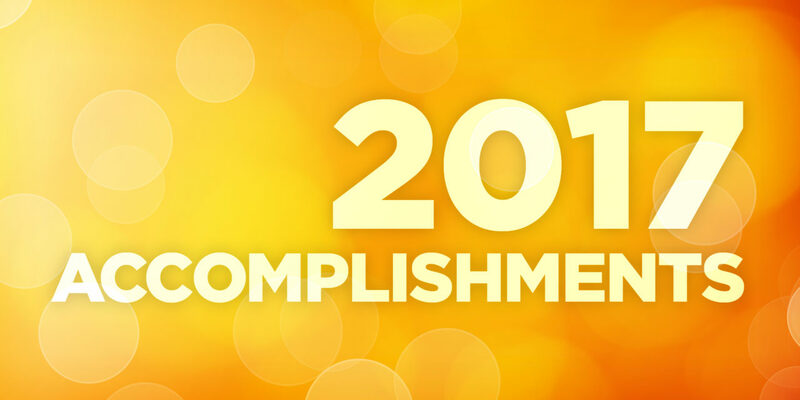 While there is still much work to do, Ingham GSC is proud of its most recent accomplishments and successes. Play and Learn Groups continued to provide socialization experiences to families receiving home visits. 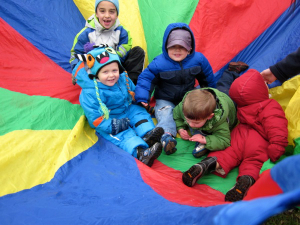 Play and Learn Groups were held in the communities where families live and are located in places where families access services, including the Harley Franks Early Childhood Center and the Grand River Head Start Center. A total of 516 children were served by the Play and Learn Groups for FY2017. The Family Coalition (known as Ingham Family Coalition since 2011) has been made up of parents, grandparents, and guardians interested in improving the lives of young children birth to eight years old by sharing feedback with those agencies that support them and their families. This has included advocating for those same agencies and developing the leadership potential in every parent/family to share their story with those in power. For the seventh consecutive year, Ingham GSC and Ingham Family Coalition participated in Community Mental Health Consumer Appreciation Zoo Days. Over 675 books were distributed to people who attended the event in 2016. A list of books focused on social-emotional health, developed by the tri-county Early Childhood Literacy Coalition, was made available to families. The Parent Leadership and Support workgroup of the Ingham GSC became the Local Home Visiting Leadership Group (LLG) and Home Visit Hub advisory group; convened by parents for over four years, bringing agencies to the discussion around a healthy home environment and how to improve home visitation services for families. The Parent Resource Guide, maintained by the workgroup, has been the most utilized resource on the Ingham GSC website over the last several years. 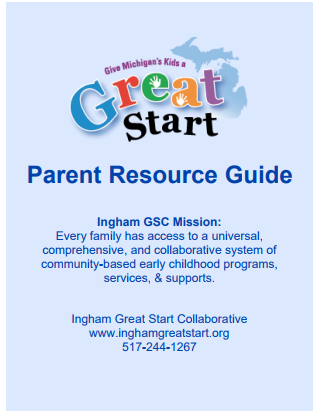 The Ingham GSPC (Family Coalition) has worked with three GSC member organizations – Ingham Great Start Readiness Program (GSRP) Advisory Council, Head Start, and Lansing Community College (LCC) CCAMPIS – to facilitate Parent Cafes with families and parents in their organizations. Specifically, with GSRP and Head Start, the Parent Liaison attended an initial GSRP Advisory meeting and a Head Start Family Advocate meeting, discussed the 5 protective factors, and how to prepare for and host a Parent Cafe with their parents. Following this, these member organizations have facilitated Parent Cafes on their own with their parents. Specifically targeting the student parent population in Ingham, the Parent Liaison co-facilitated a Parent Café with LLC’s CCAMPIS coach during one of its student networking Lunch and Learn sessions. Through the tri-county Early Childhood Literacy Coalition, Ingham GSC again partnered with Eaton GSC, Clinton GSC, CACS Head Start, WKAR, RIF Lansing, Capital Area District Library. East Lansing Public Library, Delta Township Library, Dewitt Library, and Grand Ledge Library, to sponsor two weeks of literacy events featuring storybook costume characters. MI Library joined as a partner this year. Parents were given information on the importance of literacy and ideas of ways to connect literacy Activities in everyday life at the events. The Central Resource Center and Lansing School District Family and Community Center have partnered to become a Lending Library site for the Resource Center, for families and providers to access learning materials. Working with several partners, Ingham GSC received three rounds of Federal expansion funds for home visitor services: $208,000 for each of two years funded two home visitors using the Early Head Start Home Visitor model, for services focused on the south side of Lansing; $400,000 for Nurse Family Partnership to serve first-time African American mothers by their twenty-eighth week of pregnancy; and $316,000 for two home visitors for Healthy Families America to serve at-risk pregnant women and families with newborns. 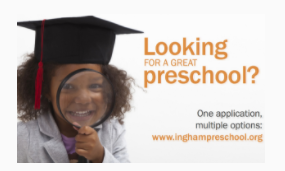 In addition, Ingham GSC partners helped Ingham ISD secure $203,930 in State funding to expand the Great Parents, Great Start Program in 2016, using the Parents As Teachers model, focusing primarily on 3 year olds outside of Lansing that are not able to access preschool programming. Through Continuous Quality Improvement projects, Ingham LLG has coordinated multiagency training for home visitors on safety with the Michigan State Police, Trauma and Secondary Trauma, and Perinatal Mood Disorders Part 1 & 2 training (which was identified by parents as a need) to further individual, as well as collective, system work and more consistent practices across programs. 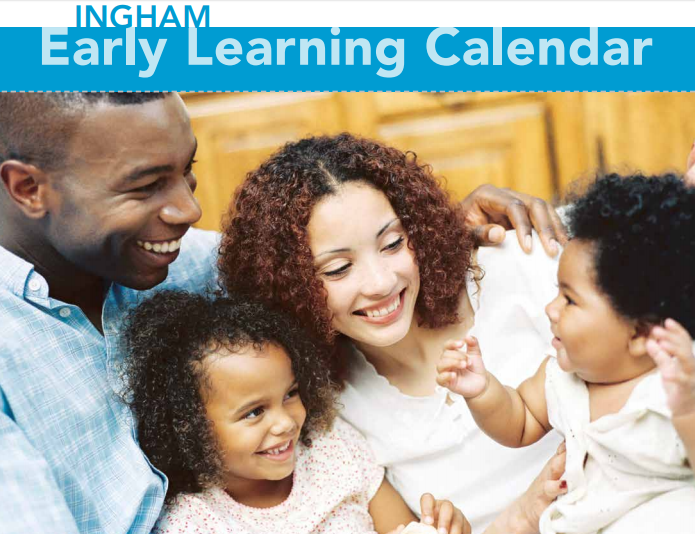 An Ingham Early Learning Calendarwas developed by the School Readiness Advisory Committee to increase awareness and understanding of school readiness beginning at birth and highlighting the Ingham Kindergarten Readiness Packet, also developed by the Committee. The Capital Area District Library took the lead on the project, and funding for 5000 Calendars was provided by the Capital Area District Library, East Lansing Library, and MSU Federal Credit Union. A distribution plan was created to intentionally distribute the Calendar first to families who may not be currently connected to services. Feedback from families who have received the Calendar has been very positive. Another order of 5000 Calendars was placed, with 10 of the 12 local school districts purchasing Calendars for district use with families of children in preschool and kindergarten. In addition, one of the local health department clinics is piloting using the Calendar during 15-month old well child visits. The GSRP Early Childhood Contact conducted a 4-hour training on school readiness and the Ingham Early Learning Calendar with both licensed and unlicensed home providers to promote using the Activities included in the Calendar during the day. The training was also an opportunity to recruit unlicensed providers to engage in the Great Start to Quality rating system. A presentation on literacy built around using the Ingham Early Learning Calendar was developed by Stepping Up Together (local Michigan Adolescent Pregnancy and Parenting Program – MIAPPP) and GSC Co-Coordinator for the statewide MIAPPP Learning Collaborative Conference. The Lansing Community College Coalition for College and Career Readiness (C3R) formed a 2Gen Workgroup to focus on the PreK to Postsecondary continuum and discuss possible Activities that could be done. The group developed a Parent Speak forum in which Student Parents shared their stories on barriers, challenges, and opportunities of being a Student Parent. The C3R 2Gen Workgroup has been a collaborative group, with the GSC, the GSFC, LCC, the CCAMPIS success coach, and the Capital Area College Access Network (CapCAN) director participating. In preparation for the Parent Speak, a parent story and testimony training was provided by the GSFC Parent Liaison and the CapCAN Director co facilitating. A parent panel of 8 very diverse parents (ages 13-33, middle school-PhD, male/female, various ethnic groups) provided testimony to a listening panel of policy makers and an audience of people. 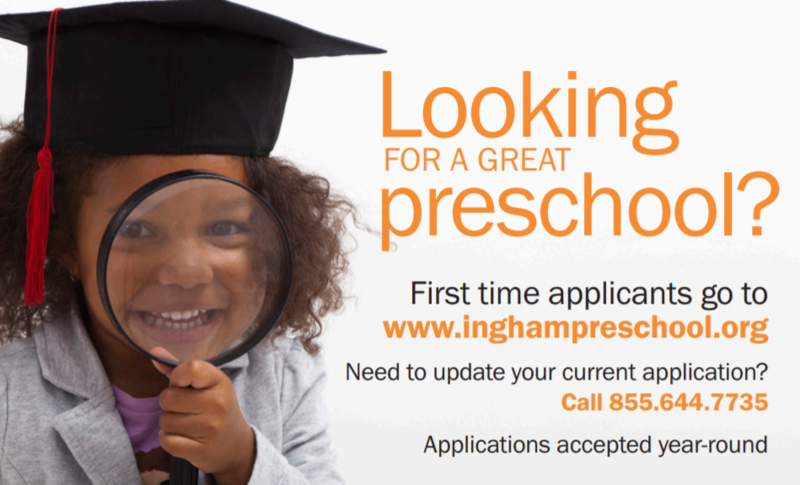 Ingham ISD, through the Great Start Readiness Program (GSRP) consortium, has been able to provide training for preschool programs in the service area. Training spots are available to consortium members first and available seats are then opened up to the community. Trainings have included: The Creative Curriculum for Preschool, Teaching Strategies GOLD Online Assessment System, The Ins and Outs of Anecdotal Record Keeping and Increasing Your Adult-Child Interactions, GSRP 101, Supporting Tier 1 Behavior in the Preschool Classroom, TS GOLD for experienced users; Individualizing for all Learners, TS GOLD for experienced users; Using the family connection. Families of all children who were enrolled in GSRP and Head Start have been utilizing a centralized, on-line system to apply for these programs for the past four years. This system provides parents the opportunity to fill out one application to be considered for tuition-free preschool placement through Head Start and GSRP, and connects families who are not eligible for these programs to tuition options. The system also tracks the status of children (enrolled, pending enrollment, waiting list, not eligible) and helps to identify communities to target outreach and recruitment efforts. Department of Human Services and Michigan Works have application materials in their lobbies, including electronic images on media screens. Lansing School District coordinated with Ingham ISD Play and Learn Groups and GSRP staff to provide Cultural Brokers to assist refugees with on-site preschool enrollment during Play and Learn Groups at Summerplace Townhomes. Through the expansion of the Great Start Readiness Program, Ingham Intermediate School District and Capital Area Community Services have partnered to offer additional GSRP/Head Start Blend program options for families in our area. The GSRP/Head Start Blend provides Head Start eligible families the services that Head Start offers in a full-day setting blending all program requirements. This opportunity allows the teaching team to work with the GSRP Early Childhood Specialist to implement a program that meets the standards of quality for both programs. Ingham GSC and members of the Family Coalition collaborated with education and health partners at the 9th annual Back to School Health Fair held in August 2017, at the Ingham County Health Department. The Back to School Health Fair provided children with needed back to school services, such as vision and hearing screenings, physicals and immunizations, and gave families information about programs and services, such as health insurance, WIC, home visiting, and preschool. A parent with a marketing background from the Family Coalition, volunteered to solicit sponsorships and grow capacity for the event for the 5th year in a row. Ingham GSC was part of the Back to School Expo and Lansing Connect4Kids, organized by The City of Lansing. The Expo and Connect4Kids connected families and children to community agencies and organizations. Services such as immunizations and vision and hearing screenings were provided, and backpacks with school supplies were distributed to thousands of children. Participation by Ingham GSC bridged the early childhood system with the K-12 system, and provided a continuum of information for families. Doctors from MSU College of Human Medicine joined the Ingham GSC Social-Emotional Workgroup and are working to develop a communication template for use between education and health providers to share information on child screenings. Toys R Us and Babies R Us partnered with Ingham GSC to hold a “Stuff the Bus” event from 7/26/17 to Labor Day to collect many needed baby and toddler items, or allowed customers to round up their purchase and make financial donations. In addition to the two stores, Ingham ISD also provided two collection sites.